Korean theaters already offer a wide variety of venues and screening formats, but soon, audiences will have an additional option: VR. The team behind Nine Days, Korea’s first VR movie designed for theatrical release, announced the film will be released in local theaters at the end of January. The 28-minute film covers the nine days ordeal of a reporter who is kidnapped during the war in the Middle East. The film’s director Patrick KWON has had two of his previous shorts, Sign Hard (2013) and MIDNIGHT TAXI (2015), screened at the Bucheon International Fantastic Film Festival (BiFan) with the latter being shown in the ScreenX format. KWON is also a director for CJ CGV 4DPLEX. The film is lead by actors SONG Yun-a (Secret, 2009) and HAN Sang-jin (Code Name : Jackal, 2012). Rather than the typical roller coaster-like experience frequently offered by VR content, Nine Days is purported to give audiences a 360-degree, spatial feeling in a theatrical setting. The film uses a theatrical VR platform and system developed by Samsung Electronics in conjunction with Wing-bong, and DAMON GAMES while production was handled by Dashy Film and VR production company 13th Floor. 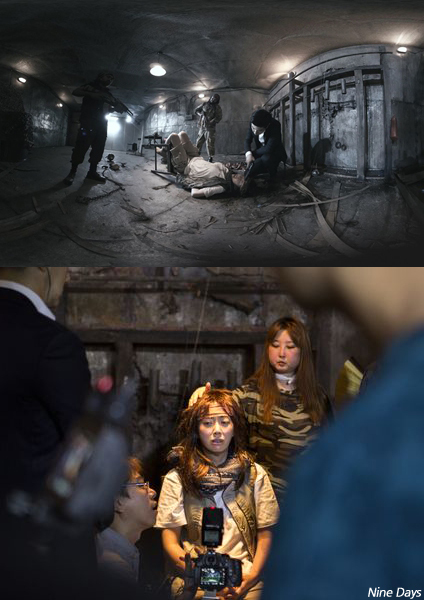 Nine Days also received production support from the Korean Film Council (KOFIC). Prior to its domestic theatrical bow, Nine Days competed in the Best Live Action Narrative category at the 2018 Las Vegas VR Fest’s Online VR/AR Competition.